Monday mornings are exciting times at the Brighton Point Ward parking lot! This BRIGHTON LDS CAMP CENTRAL BUS LOCATION is located at 3455 East Bengal Blvd. (7800 South) Salt Lake City, UT 84121. This is where campers and parents as well as ward and stake YW leaders gather in preparation for campers to ride the bus to Brighton Camp. We ask that parents arrive at the central bus location between 7:45 and 8:00 a.m. Parents/Guardians are responsible to provide transportation to the central bus location. Remember that no food is allowed on the bus. We recommend NO "send-off" treats! The building will not be open for restroom or drinking fountain use. Campers can load their gear on any bus and and get onto any the bus. They are all going the same place! The buses will depart at 8:30 a.m.
Friday afternoons are also exciting times! This is where campers arrive after their week at Brighton Camp, are warmly greeted and picked up for a ride home. We ask that Brighton Representatives and parents arrive at the central bus location by Noon. Parents are to arrive between 12:10 and 12:20 p.m. on Friday afternoon. 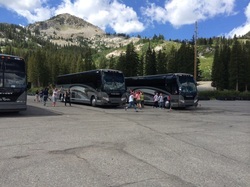 The buses leave camp at noon and will return to the central bus location between 12:30 and 12:35 p.m.
Campers are returning after a wonderful week in the beautiful mountains of Brighton! Their hearts are filled with camp stories, spiritual experiences and adventures. They can hardly wait to see and share with their family members all that has happened at Brighton! This is a great opportunity to show your love and support to your Beehives! PLEASE MAKE SURE SOMEONE IS THERE TO GREET EVERY CAMPER!! It is so sad for a solitary camper to wait for their ride after everyone else has left! Do not leave your camper waiting for you. Please arrive on time. Parents/Guardians are responsible to meet their own camper, gather their gear and provide transportation from the central bus location. Brighton stake and ward representatives are asked to not only greet their Beehives, but to gather up any "lost and found" items belonging to members of their stake/ward and see that they are returned. A member of the Brighton Committee will be there to welcome the campers home and do a final check of the buses for any "lost and found" items. For items lost at camp or the central bus location, please contact Jenny Hale (Ducks) by email at transportationducks@brightonldscamp.org. Click HERE to download a pdf version of Brighton Central Bus Location information.